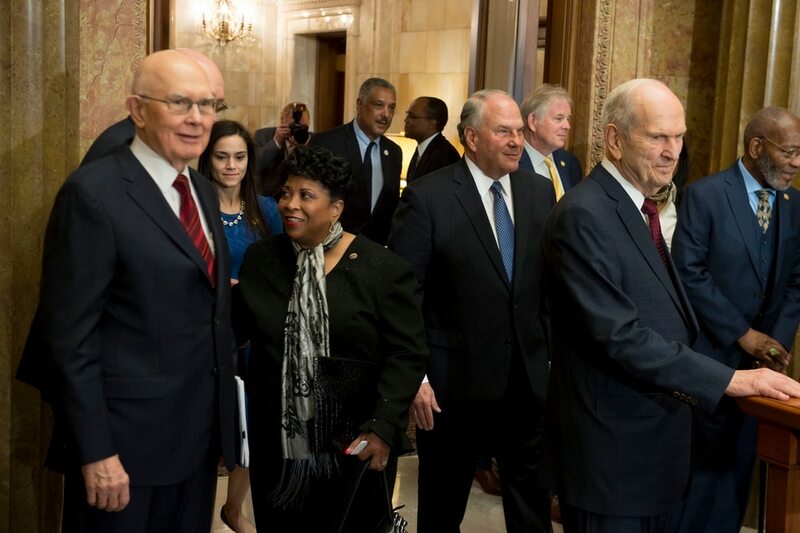 (Jeremy Harmon | The Salt Lake Tribune) President Russell M. Nelson enters the room with NAACP leaders and other LDS Church leaders during an event on May 17, 2018, where the two groups discussed the need for greater civility and called for an end to prejudice. 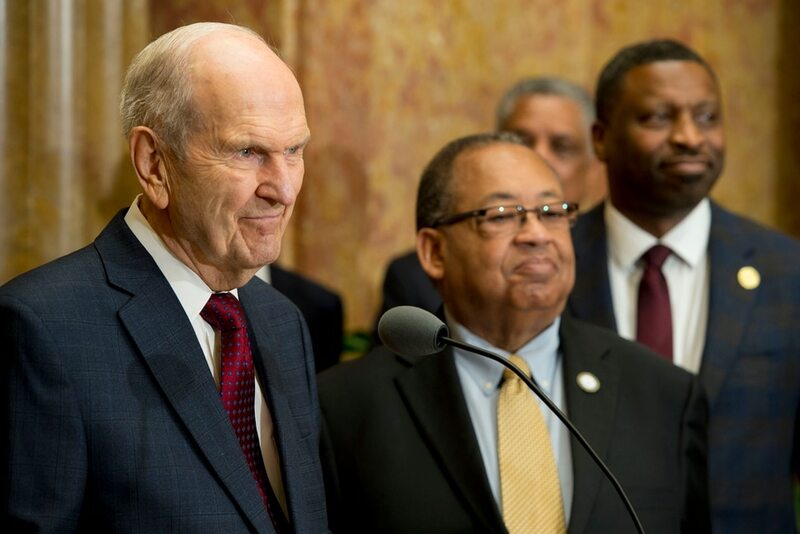 (Jeremy Harmon | The Salt Lake Tribune) President Russell M. Nelson of The Church of Jesus Christ of Latter-day Saints appears with NAACP leaders Leon Russell, center, and Derrick Johnson on May 17, 2018, where the two groups emphasized a need for greater civility and called for an end to prejudice. (Jeremy Harmon | The Salt Lake Tribune) Derrick Johnson, President and CEO of the NAACP, shakes hands with President Russell M. Nelson after speaking during an event on May 17, 2018, where LDS and NAACP leaders emphasized a need for greater civility and called for an end to prejudice. (Jeremy Harmon | The Salt Lake Tribune) Derrick Johnson, President and CEO of the NAACP, makes the rounds with various media outlets after speaking at an event on May 17, 2018, where LDS and NAACP leaders emphasized a need for greater civility and called for an end to prejudice. (Jeremy Harmon | The Salt Lake Tribune) Derrick Johnson, President and CEO of the NAACP, makes the rounds with various media outlets after speaking at an event on May 17, 2018, where LDS and NAACP leaders emphasized a need for greater civility and called for an end to prejudice. (Jeremy Harmon | The Salt Lake Tribune) Derrick Johnson, President and CEO of the NAACP, speaks during an event on May 17, 2018, where LDS and NAACP leaders emphasize a need for greater civility and call for an end to prejudice. President Russell M. Nelson is at the left. (Jeremy Harmon | The Salt Lake Tribune) Derrick Johnson, President and CEO of the NAACP, speaks during an event on May 17, 2018, where LDS and NAACP leaders emphasize a need for greater civility and call for an end to prejudice. President Russell M. Nelson is at the left. In a dramatic gesture on the 64th anniversary of the landmark Brown v. Board of Education decision, Mormon church President Russell M. Nelson strolled decisively into a news conference Thursday at the LDS Administration Building in downtown Salt Lake City arm in arm with top NAACP officers. The mutual respect was palpable as the two sets of white and black leaders described plans for future joint efforts. Johnson said his historic civil rights organization looked forward to many collaborative activities. 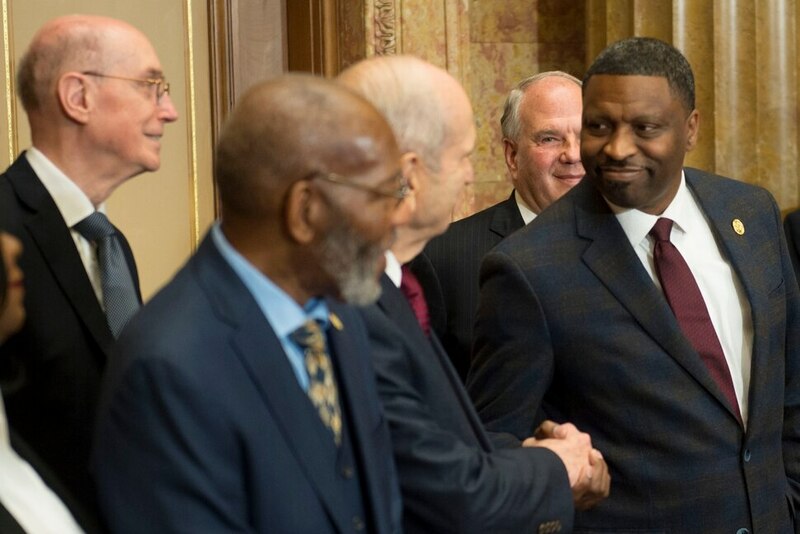 Johnson said the ties being established between the Utah-based faith and the NAACP should serve as a model for how groups can unite to achieve common goals. Several invited black Mormons — including LDS icons Darius Gray, Don Harwell and Cathy Stokes — filled front rows as the statements were read and exulted at the unity between the groups. Jeanetta Williams, president of the Salt Lake branch of the NAACP, also was on hand. NAACP officials described the meeting as cordial. Zandra Vranes, co-author of “Diary of Two Mad Black Mormons,” applauds the exchange but was hoping for more. For many, Thursday’s watershed meeting and statements seem particularly potent, given the previous tension between the two organizations. In the 1960s, the NAACP protested Mormonism’s racial ban, excluding men and boys from the faith’s all-male priesthood and women and girls from its temples. Even after that prohibition ended in June 1978, prejudice and racist attitudes persist to this day among some Mormons, causing continued pain for Latter-day Saints of color — even as membership skyrockets in Africa. But the church’s racial history never came up in this week’s meeting, said the NAACP president. Wilbur Colom, an adviser to Johnson, said the group met Wednesday with Clark Gilbert, who shared with the NAACP members information about the church’s Pathway program, an online educational outreach service.